Hello. Welcome to About Us at Keppel Coast Paving Yeppoon. My name is Duwayne Keefe and I own and operate this local Yeppoon business. I have over 31 years of experience in landscaping, paving, and hand-built retaining walls. I hold many certificates, trade qualifications, and licences. These qualifications enable me to operate Keppel Coast Paving and Big Wall Builders with expertise, good skills, and knowledge. We are a local family business operating from Yeppoon since 1991. In fact, we work everywhere on the Capricorn Coast, Rockhampton, and its surrounding areas, including Gracemere and Mt Morgan. Keppel Coast Paving Yeppoon are proud to say that with the professional help from our team, we have constructed hundreds of retaining walls. We have laid many meters of paving and all with good quality workmanship, resulting in happy clients. Our business has a work scope that ranges from small paved patio areas and small gardens to large street projects and subdivisions. Quotes are always done promptly and professionally. After visiting your job site, I will chat with you about the work that you want to be done on your property. I can have a quote back to you in approximately three days. 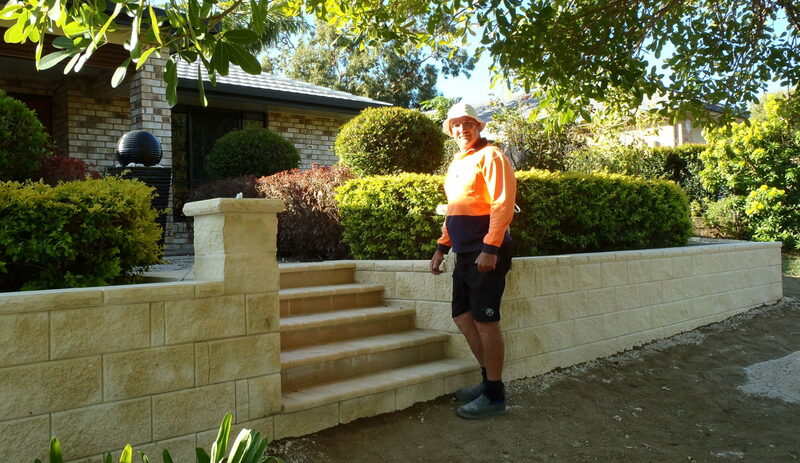 The majority of our clients, who use Keppel Coast Paving and Big Wall Builders, have us build domestic landscapes with front and backyard projects. Some of these have been very challenging on difficult sloping sites. However, each and every client has been more than satisfied with our work. We are proud to say that Keppel Coast Paving constructed the main area of the Emu Park Memorial Cenotaph. I was happy to create and donate the rock carving of 'The Singing Ship', which can be seen when you visit there. Or click here to take a look at our project. Our team at Keppel Coast Paving and Big Wall Builders build your project and our reputation with top quality workmanship, pride, and integrity.